Today, I went on my first REAL run in over a month: 5 miles in an hr. They were slow and spread out by some short walks. It’s amazing how much fitness I feel like I’ve lost in that short time. After my last half marathon (Disney Princess, plan to do an uber belated review at some point) I kind of wanted a little break from running for a week or two, then planned to get back to training for the IronGirl Half here in Clearwater. However, a week after the race, I had an unfortunate encounter between my pinkie toe and the couch. The couch won Since then my running was non-existent for nearly a month to allow the toe to heal- let me tell you, that little broken toe HURT– and even when I started again, was infrequent and very leisurely, with no race on the books til Nov. However, I realized my birthday is coming up very shortly, and my goal to lose 10 lbs by May 6 is only 2-3 lbs away, soooooooo I’m cleaning up my eats, and runnin like I have somewhere to be! Make some noise if you think I can do it! 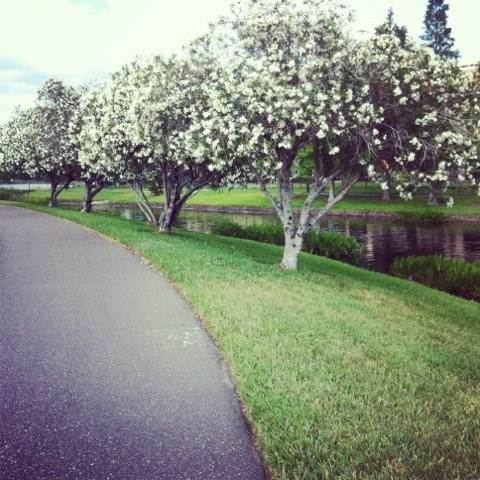 This was the view on my run, btw- the Dogwood trees are so pretty!